While everybody is busy with their own life, recently there was a big trend ongoing in the skincare line. From facebook, instagram, blogs, twitter, everyone Jelly here Jelly there. So what exactly this Jelly is about ? Out of curiosity + persuading by Ling, I decided to take a try on this product. I'm always a counter cosmetic person, where I don't really believe in other products. Currently my favorite mask is definitely from Estée Lauder, but seems like they had discountinued the product. Other than that, Laneige water sleeping pack EX is definitely another favorite of mine for hydrating purpose. Okay back to the Jelly story, the Jelly thing is actually gel type mask, developed by the renowned Dr Yulong Moy from USA. The first of its kind facial mask with Active Cellular Factor. This unique mask retain 70% more moisture than other sheet mask, it forces the skin pores to fully absorb the nourishing ingredients while drawing out the impurities instantaneously. it also inhibit melanin synthesis, which lightens pigmentation, balances uneven skin tone, leaves your skin brighter and supple with dewy fresh vibrance. Seems like it's some osmosis process thing..
After reading so much review, now it's my turn to write one. The one I bought is in Jar, cost me RM130. The texture is gel like. Jelly. Each bottle comes with a spatula, make sure to use it for hygienic purpose. So after cleaning my face with daily cleanser, I apply the Jelly all over my face. Required amount is quite a lot, you'll have to apply a thick layer to your face. around 3-5mm.. Make sure to apply more on your T-zone. As the Jelly also claims to remove black heads and tighten pores. Of course, T-zone usually has the most obvious pores. Wait for 40minutes, you can relax, or just go ahead and continue with your undone task. What I like about the mask is it won't drip down any essence, won't displaced like sheet mask do. Also, you can freely smile, laugh as hard as you can, unlike using clay mask / peeling mask which harden over time. Next, you'll have to scrap the jelly off using the spatula again, and then wash your face with water till there's no more residue. Left was before and right was after. Skin definitely become brighter but it is not obvious due to my dark lightning in the room. Also, my skin is now less yellow compared to before. Also, for the nose part, I noticed that white heads has came out from underneath the skin, but I'll have to remove them manually using a tweezers. Speaking of the purifying power, yes can be seen from the white head case. Blemishes did not go down, but skin feel more moisturized and softer. However, I personally think that it is more to a short term hydration. I guess that's why I'm instructed to use the mask as least 3 times per week for the first month, and then once or twice per week second months onwards. Personally think also my skin become brighter and fairer. Last step will be your normal skincare routine again. For me, I'll use my Biotherm Purefect Skin Toner and moisturizer..Love this range as it reduce down breakout from my skin. 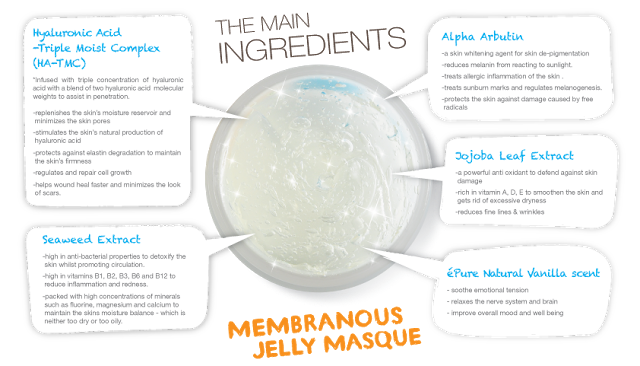 In overall, éPure Membranous Jelly Masque did shows improvement on my problematic skin. However, pores reduction is not that obvious. Might have to go for a long term use to see more obvious result. Pricewise, RM130 for a 250g bottle of mask. It seems expensive but it will last around 9 to 10 use. RM 13 each time ? Worth it or not, judge it by yourself. However, I've heard from others that you'll have to continuously use this. Or else face will go very dull looking. I'm still seeking for a confirmation. Will update when I got the answer.